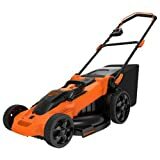 Electric lawn mowers are growing in popularity due to their minimal maintenance requirements and environmentally-friendly design. However, most users hate having to use an electric cable while mowing. Fortunately, there are several cordless options available now. 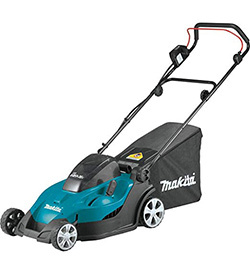 The purpose of our article is to review 10 of the best cordless lawn mower models. We’re going to rank our choices using both user popularity and overall cost efficiency. 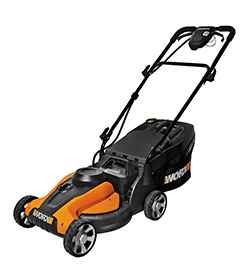 Our 10th best cordless lawn mower recommendation is made by VonHaus. One of the things we like best about this particular product is that it’s extremely affordable. It also features six different adjustable cutting heights. This makes it an ideal pick for finicky grass types like St. Augustine that tend to burn easily when cut too short. 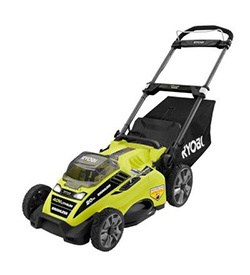 However, we cannot stress enough that this mower is mainly for smaller landscaping needs. It runs for approximately 28 minutes on a full charge. Thankfully, it does charge rather quickly at 2.5 hours. The Makita XML02PTX1 is a lightweight option that is perfect for users who value portability and convenience. This product features an LED battery meter that displays the remaining energy level during operation. In addition, it also comes with a catcher attachment that collects yard clippings for easy disposal. 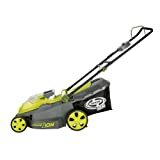 Just keep in mind that it’s still intended for lighter landscaping tasks, with an operational time of 30 minutes. The Earthwise 60420 is an excellent choice for consumers who want to create their own mulch using finely cut yard clippings. You can also opt for the convenient bagging attachment that allows you to store the clippings in a designated compost bin for later use. In addition to its powerful blade and electric motor, we found the ergonomic handle design to be very comfortable. The only issue is that it cost a bit more than some of the other choices. Ryobi has long been one of the most popular brands in home improvement tools. 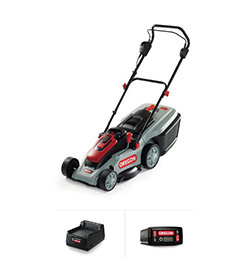 Their cordless electric mower is no different with its powerful 40-volt electric engine. It also has a larger cutting radius with a 20-inch deck design. As for attachments, you can use a standard bagger for easy disposal of your yard clippings. 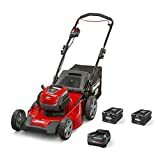 Just be aware that this is a larger lawn mower model that requires more space to store. 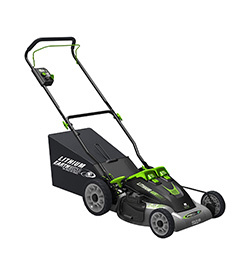 In terms of operational time, the Oregon LM300 is one of the best cordless lawn mower models available. 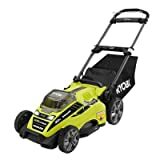 It can continuously mow for up to 5,000 feet on a full charge. In addition, the handles can be adjusted to get the correct fit for your height and frame. This model also features Premium Cell technology. 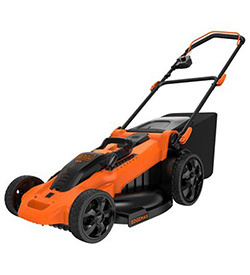 This helps the mower hold its charge for up to a month when it’s in standby mode. The only drawback is that the bagger attachment is slightly cumbersome to install and remove. 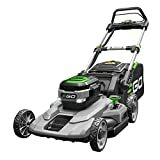 Although the EGO cordless electric lawn mower is on the expensive side, it offers many exciting features that are worth the extra cash, one of the most important being the extremely low charging time. 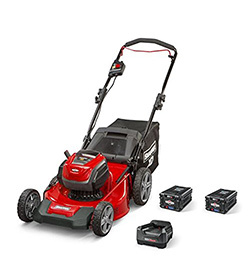 With its quick charge feature, you can have the lawn mower fully charged in just 40 minutes. This is one of the lowest charging times of any product on our list. It also has a higher than average operational time of approximately 45 minutes. The feature that stands out most with the Worx WG782 is its IntelliCut system. 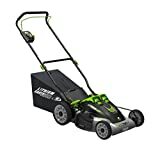 This causes the electric motor to adjust the power level to the cutting blade based on the density of the grass you are cutting. 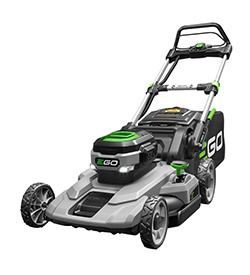 In addition to helping conserve energy, this ensures the blade has the power it needs to cut through tough grass. When fully charged, it can run for up to 40 minutes continuously. Just keep in mind that the cutting blade is a bit smaller in size. The Snapper XD SXDWM82K is one of the only products we found that features multiple detachable battery packs. This allows for fewer interruptions when dealing with larger landscaping projects. It also charges rather quickly, with two battery packs taking just 60 minutes to fully charge. As for operational time, it can run for up to 45 minutes. Our only issue with it is that this model is a bit on the expensive side. 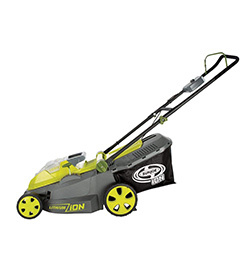 For customers who are concerned about noise, the Sun Joe iON17LM is the best cordless lawn mower we could find. In addition to its quiet engine design, it can also be adjusted with six different individual cutting heights. Just keep in mind that the overall size is quite small, with a cutting width of 16 inches. For users with larger lawns, you may want to opt for a model with more cutting width. 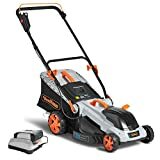 Our number one best cordless electric lawn mower pick is the BLACK+DECKER CM2040. This model can be used to mulch, bag, or discharge clippings via the side chute. It also comes with a variable speed motor that helps conserve battery life. As for cutting width, this is one of the largest choices on our list, measuring 20 inches across. The purchase price is the only issue, with its price point falling somewhere in the middle. 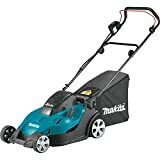 When searching for the best cordless lawn mower, make sure you take the size of your yard into account. The products we reviewed are all excellent choices that come in various sizes and power ranges. If there is a product that you feel we should mention, please tell us about it in the comments.